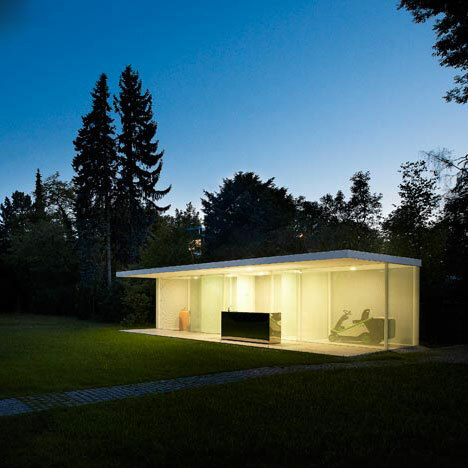 Photographer Julien Lanoo has sent us his photos of this transparent pool house in Munich, Germany by Berlin studio Baumhauer. Poolhaus is a glass and steel construction, with white screed floors, and a polished stainless steel island containing a sink. Rather than being hidden, everything contained in the pool house can be seen from outside through glazing and translucent curtains. All photographs are by Julien Lanoo. Here's some more from the architects. The facilities are intentionally placed in a vitrine. Their outlines are both fracrured and distorted by the mirrored vegetation on the glass façade. Toilet, shower, changing room: The level of intimacy can individually be adjusted by curtains. Click on the symbol in the bottom right of the video player above to view the movie in full-screen HD. Can’t see the movie? Click here.